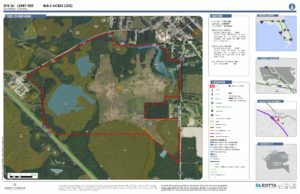 Jasper, FL – Today, the Hamilton County Development Authority (HCDA) along with Duke Energy announced the selection of nearly 470 acres in Jennings for inclusion in Duke’s Site Readiness Program. The program is intended to identify, assess, improve, and increase awareness of industrial sites in the Duke Energy service territory. The site, located near Jennings, consists of 468 upland acres proving I-75 frontage and easy access to I-10 and State Road 143. The site also boasts more than 260,000 people in a 30-minute radius, of which more than 27 percent have an associate degree or higher. It’s strategic positioning along with the talent pipeline make it an ideal site for Duke’s program and manufacturers looking to take advantage of the state’s low tax burden. The goal of the program is to increase the inventory of quality industrial sites throughout the territories that Duke Energy serves, and to advance the state of readiness of these sites. It is not a “site certification” process, but rather a program to help local economic development organizations find and prepare potential sites. To qualify for the Site Readiness Program a site must be a legitimate industrial or data center site (usually 75 or more acres) and Duke Energy must either be the designated electric service provider or at least be able to compete to serve the site. The site can either be a single site for a large facility or a potential industrial park (multi‐tenant site). Nearly 20 “Site Readiness” sites have been evaluated in Florida through 2017 and five more sites in the state currently being evaluated. There are 154 Duke-served properties identified for potential development through the Florida Strategic Sites Inventory (SSI) Program – a GIS based site discovery program funded by Duke and other economic development partners. There have been 34 major projects won on Site Readiness sites across the Duke Energy footprint creating more than 6,800 new jobs and more than $7.0 billion in capital investment.